Due to time constraints and having recently purchased the Metal Gear Solid HD Collection I will be putting the reviews of ‘Under The Lake’ and ‘Before the Flood’ into one post. And then an opinion on the two parter as a whole at the end. Read on! Ghosts! In an underwater base! That’s the crazy pitch for the first half of this two parter. It sounds ridiculous and it kinda is, but when Doctor Who is good it is really good. This episode feels like an old monster-of-the-week type episode, back before Doctor Who thought it needed arcs and River Song. It’s a no nonsense spooky sci-fi story. The episode begins with a mystery team of military types investigating salvage in their underwater base, in the year 2110/ The salvage, a wrecked spaceship, is the type of thing you should know better than to to mess with. As you’d expect things go wrong pretty quickly and the team are fighting ghosts. Where are they from? What do they want? Luckily to answer these questions we have The Doctor. 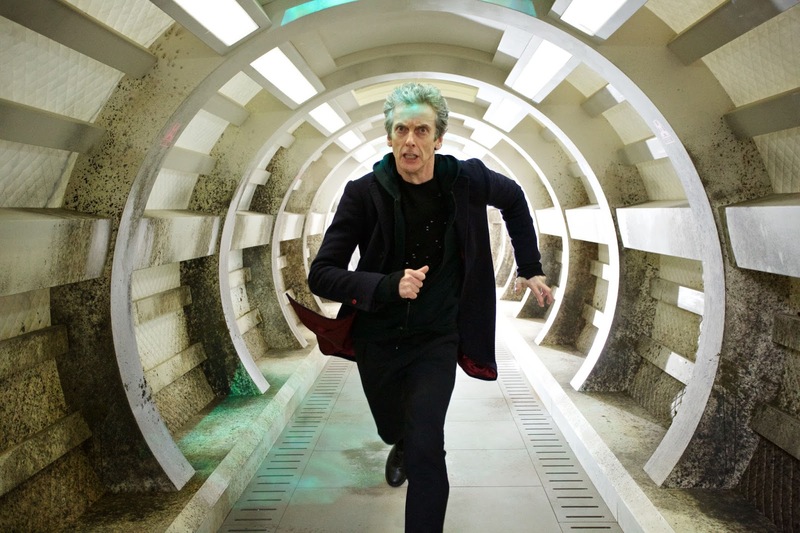 Peter Capaldi was excellent in this episode. He is just so interesting to watch on screen, with his mixture of manic confusion when trying to figure out what he’s up against, and wide eyed excitement at the most inappropriate times. 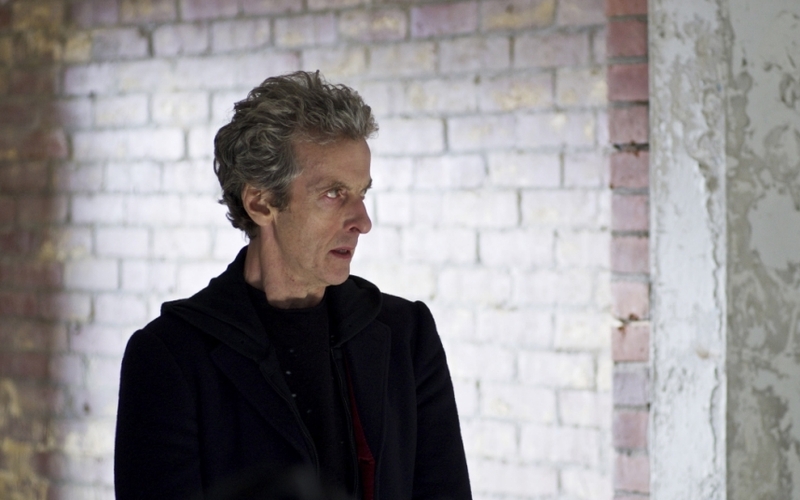 There is a great scene in which Clara hands him some cue cards to help him talk to the grieving group. It’s cool seeing Clara rubbing off on the Doctor like that. Toby Whithouse gave the Doctor some fun lines, including references to Shirley Bassey and a jab at Peter Andre (“After two weeks with Peter Andre’s Mysterious Girl stuck in my head, I was begging for the brush of death’s merciful hand.”) It was better this week to see the doctor confused, he didn’t have all the answers. And so far it seems that he isn’t pulling the old “I knew what was going on all along trick” like he has in the past. Like I said earlier, this is a throwback to Who of old. Which means lots of running down corridors. In the best possible way of course. Sometimes you don’t want a complicated plot, sometimes it’s better to just have ghosts in an underwater base. All of the clues are laid out for the audience just like they are for the Doctor and Clara and we are left in or dark, or figuring it out, right along side them. 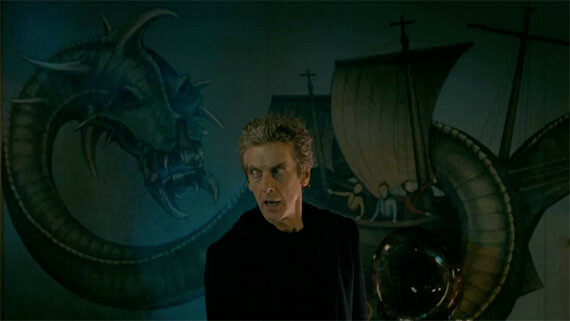 Once it gets moving ‘Under the Lake’ moves quickly, with the Doctor coming up with a plan to ensnare the ghosts and figure out what exactly they are. And hopefully it managed to scare a couple of the younger viewers. It does everything a first half of a two part story should do, it sets up an awesome story, doesn’t reveal too much of the outcome and leaves you annoyed that you have to wait a week to see the next part. The trouble with episodes being split into two parts is that they run the risk of hyping something up, and then not being able to deliver. Luckily ‘Before The Flood’ manages to avoid this. Just about. And the baddie in this episode was amazing! The Fisher King was a sight to behold, looking at him he felt like a classic bad guy. He was menacing, had an original look about him and that scene where he faced down against a tidal wave (and admittedly died) was awesome. The only sad part is that we could have seen more of him. I wouldn’t have complained if he and the Doctor had perhaps one more scene together. The big idea in this episode was the concept of the bootstrap paradox. This is so important to the plot that the Doctor actually explains it to the audience in a fun fourth-wall breaking scene at the beginning of the episode. At first I thought it was weird that the Doctor was talking to…well us. But he’s got such a personality that you soon forget, like Frank Underwood in House of Cards. The paradox is the idea that a future event is the cause of a past event, which in turn is the cause of the future event (according to Wikipedia). In the Doctor’s example, you go back in time to meet Beethoven and find he doesn’t exist. You copy Beethoven’s work from your future knowledge and it becomes famous. You copied yourself, who copied yourself, who copied yourself etc etc. It’s a tricky idea for little kids. And then there’s the fact that the Doctor’s saving of the day hinges on this paradox. Some people might complain that the episode ends on a wink and a nod at how crazy it is, but I love it. It’s nice to see some more classic science fiction concepts in the show again. And leaving the audience to try and wrap their head around it is a brave move. At the very least you’ll be thinking about it for at least a week afterwards. Overall this two parter was excellent. Funny and dark, complicated science fiction ideas but something kids will enjoy. The experiment of using two part stories has really paid off for Moffat and co. It allows for greater narratives and doesn’t feel like if you stop concentrating for a second, you’ll be lost under the dialogue. Two episodes gives it time to expand and breath. It’s perfect. Doctor Who has rarely been better. p.s. Please don’t make me look silly in a few weeks Mr. Moffat.